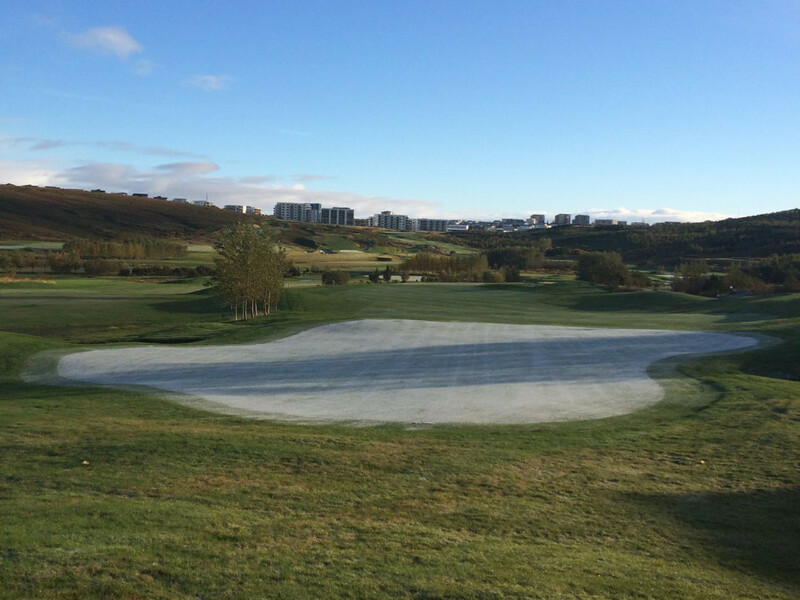 The municipal golf club of Gardabær & Kópavogur (GKG) in Iceland has started constructing a new clubhouse. As the new clubhouse is taking up more space we were assigned with relocating and designing the new 18th green and surroundings. With a first site visit summer 2014 we started construction in October after the main golf season slowed down. Even around the 0° Celsius mark golfers are still showing up to play onto the winter greens, as long as there is no (or not too much) snow on the ground Icelandic golfers will keep on playing. The 18th green plus 1st tees were relocated and reshaped, making the new clubhouse and surroundings stand out in design and following modern design standards. At the 18th turning point a temporary green was laid down making the last hole a par 3 during the construction period to allow for full 18 holes to be played.